Drones attacks in Libya: An unprecedented expansion of presidential power. Along with an unprecedented expansion of the president’s power. 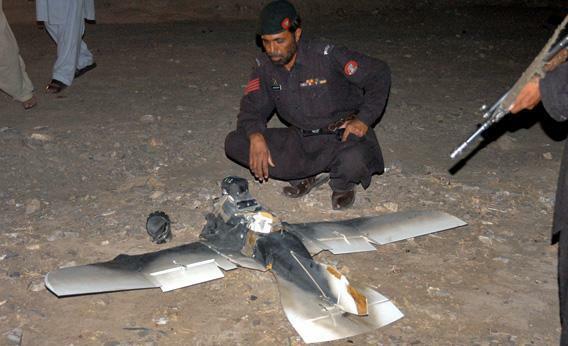 Pakistani security personnel examine a crashed American surveillance drone in Pakistan in 2011. Photo by Asghar Achakzai/AFP/Getty Images. After the attack on American diplomats in Benghazi last month, President Obama vowed to hunt down the killers and bring them to justice. There is a good chance that this means that they will be incinerated by missiles fired from drones. If so, the United States will have used drones to kill members of al-Qaida and affiliated groups in Afghanistan, Iraq, Pakistan, Somalia, Yemen, and Libya—six countries in just a few years. Mali may take its turn as the seventh. This startlingly fast spread of drone warfare signifies a revolution in foreign affairs. And, for good or for ill, in an unprecedented way it has transformed the U.S. presidency into the most powerful national office in at least half a century. In the past, presidents faced two major obstacles when trying to use force abroad. The first was technological. The available options—troops, naval vessels, or air power—posed significant risks to American military personnel, cost a lot of money, proved effective only under limited conditions, or all of the above. Dead and maimed soldiers, hostages, the massive expense of a large-scale military operation, and backlash from civilian casualties can destroy a presidency, as Vietnam and Iraq showed. The second obstacle was constitutional. The Constitution includes a clause that gives Congress the power to declare war. Presidents have been able to evade this clause for small wars—those involving only naval or air power, or a small number of troops for a limited period of time. They have mostly felt compelled to seek congressional authorization for large wars, no doubt in part so that they could spread the blame if something went awry. But drones have changed the calculus. Because they are cheap and do not risk the lives of American soldiers, these weapons remove the technological obstacle to the use of force. And because drone strikes resemble limited air attacks, they seem to fall into the de facto “small wars” exception to the Constitution’s declare-war requirement. Unlike large wars, drone actions do not provoke congressional attention or even much political debate. Yet it is a mistake to think that drone warfare will resemble the small wars of the past—the air assault on Libya in 2011, which lasted seven months; or the air assault on Serbia in 1999, which lasted three months; or even the military invasion of Panama in 1989-1990, which lasted one month. Drones can be, and increasingly are, deployed continuously, outside the theater of war, anywhere that a threat takes shape. They are not subject to the rhythm of mobilization and demobilization that occurs in a regular war. They’re used not only as part of a larger arsenal flung against a nation-state but also on their own as police sentinels, which pick off individuals and organizations thought likely to commit terrorist attacks in the future. They’re a global law-enforcement operation—on a far larger scale than you might assume. According to one source, drones have killed more than 2,500 people in Pakistan since 2004, more than 350 people in Yemen since 2002, and more than 50 people in Somalia since 2007. Defenders of drones point out that drones kill targets more accurately than conventional military weapons do. Because drones linger over their victims, operators can check for civilians before pulling the trigger. But that makes it irresistible for presidents to use them. Even if the civilian death rate remains low relative to that of conventional military operations (with estimates in Pakistan ranging from 5 to 20 percent of total deaths), the absolute number of civilian deaths will increase as drone warfare surges. The American president, long considered the most powerful man in the world, can now routinely sling thunderbolts at his enemies like Zeus, subject to virtually no constraints. It is tempting to think that the president’s power to kill foreigners on a whim represents a failure of our constitutional system, which sought to ensnare the executive in a web of institutions that prevent the excessive accumulation of power in one man. But the constitutional goal was to protect Americans, not foreigners. Our Constitution has evolved to give the president the discretionary power to use force abroad because strong electoral incentives compel him to use it to advance national security, while Congress and the courts are parochial and cumbersome institutions that lack the capacity to react quickly to changing events. Although the president’s power to use force against Americans remains constrained by judicial process, at least as long as they do not join al-Qaida, foreigners abroad are on their own. President Obama has acquired legal authority for drone warfare from the Authorization for Use of Military Force, the statute that Congress enacted at the request of the Bush administration just after the Sept. 11 attacks and was effectively a declaration of war against al-Qaida. Back then, one might have thought that the AUMF would authorize military operations in Afghanistan for just as long as necessary to defeat al-Qaida and the Taliban. But al-Qaida has spread into multiple countries, and independent groups have affiliated themselves with al-Qaida in order to obtain credibility and assistance. The AUMF will deliver war-making authority to presidents for decades to come. And even if the president wants to fling drones at non-al-Qaida targets, he can. Although President Obama initially distanced himself from President Bush’s claim that Article 2 of the Constitution gives the president the authority to use force unilaterally to protect American interests, he used this justification for the 2011 Libya intervention, which was not authorized by Congress, and he would likely use it to justify an indefinite expansion of drone warfare against any security threat, including Iran, for example. Congress will not try to stop him. New threats emerge constantly, leaving no time for a congressional debate before each strike is authorized. Thus, Congress must either hand the president blanket authority to use drones as necessary—the implicit status quo today—or block him, which would outrage Americans who fear terrorism. The choice for our pusillanimous legislature, which so far has acted mainly to prevent President Obama from cutting back on some Bush-era tactics, is obvious. Courts will also not stop the drone program. Judges say that they possess no authority to interfere with military activities abroad, cannot compel the government to disclose secret information that would be necessary to referee a challenge, and cannot order government officials to pay damages for harm that they cause as they discharge their duties. Judges lack the capacity to second-guess the political and military judgments of the president, and they know it. The Constitution has thus become a sleek and lethal machine for projecting violence abroad in order to protect Americans without risking democratic values at home. No downside exists unless you live in a foreign country in Southwest Asia or North Africa, where people deemed terrorists and those living among them will start dying in ever greater numbers as the drone program swells into a worldwide system of policing. The long-term prognosis for the reputation of the United States is surely bad; the political imperative to protect the country has overwhelmed President Obama’s earlier impulse to mend the harm done to the reputation of the United States during the Bush years. But the short term always trumps the long term in national security. Unless American voters discover a humanitarian impulse to respect the lives of foreigners that has hitherto been lacking and call their president off, America could become a predatory state—without even realizing it.